The Curriculum at St Thomas More Catholic Academy is underpinned by the values and principles outlined in our Academy Mission Statement: As an Academy at the heart of the community we aim to raise the expectations and achievements of all learners; we aim to change for the better the lives and life chances of all members of our community and prepare them for life beyond school. We are committed to the achievement of rapid educational transformation within the college through the development of outstanding practice based through sustainable collaboration. We will ensure that all our students have the opportunity to reach their full potential through the provision of a broad and balanced curriculum delivered within a caring and supportive environment. The on-going professional development of all staff will ensure sustainability and assist in the creation of a culture of continued improvement where students strive to achieve at the highest level; where they ‘aspire to be more’. 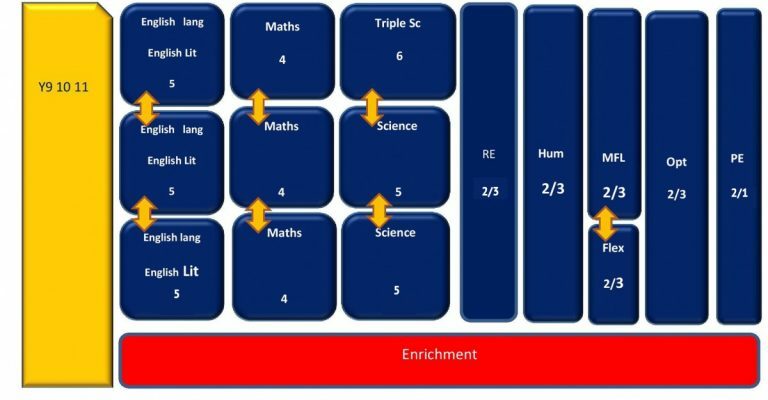 To ensure that all students make good progress and reach their full potential we place students in Year 9 onto targeted Pathways according to their individual needs. Each Pathway has a slightly different content and focus. There are 3 Pathways as outlined below. Each Pathway has an element of choice for students, to allow them to personalise their route through to Year 11. There are also a number of compulsory subjects that all students must follow regardless of their Pathway. Where appropriate, we also arrange offsite alternative provision with a personalised onsite timetable, which is tailored to meet the needs of each young person.